A documentary seeks to capture the contribution of Jews to Indian cinema right from the early days. What motivated you to tackle this unusual and unlikely subject? The fact that it’s unlikely led me to tackle it. It was surprising and intriguing. I didn’t know the full extent of the story, but when I was given an obituary of Nadira (real name Florence Ezekiel), in 2006, my first thought was, “Wow, it’d be interesting to make a film on her.” But when I went to India, it turned out that she wasn’t the only Jewish actress in Bollywood, that she was the last of the long line that went all the way back to the silent era with Sulochana. So the more I looked into the story, the more interesting it became. Since several Jewish actors worked during the era of silent films, and some post-independence, it must have been tough to procure the reels of their films – given the poor state of film archiving in the country. What were some of the other roadblocks? The archive problem was a massive one. More so because all the Jewish stars are deceased – or “expired” as they say in India. Given that they were big household names, I was certain that there’d be an interview on radio, or news footage from one of the film events. Sulochana, for example, was given the Dada Saheb Phalke Award in 1973. But it was impossible to get anything. The Phalke organisation wouldn’t even respond to my e-mails or phone calls. I’m still sure that somewhere within the archives of Filmfare Awards there must be photos of actors like David and Nadira. The actor David (David Abraham Cheulkar) often used to host the award nights; Nadira was a regular attendee. Or of Sulochana being honoured the Dada Saheb Phalke Award. But I didn’t get any. So I realised that I’d have to do this film without the official channels in India and, to be honest, coming to India as a white guy, everyone thinks that you’re rich and up to be bribed. So that was a bit shocking. But once I got over that, I decided that I’d have to make this film on my own, and so I went elsewhere to find material. And that influenced the way the film was told, because in absence of film reels or photos, I started using animation to bring the Jewish stars to life. 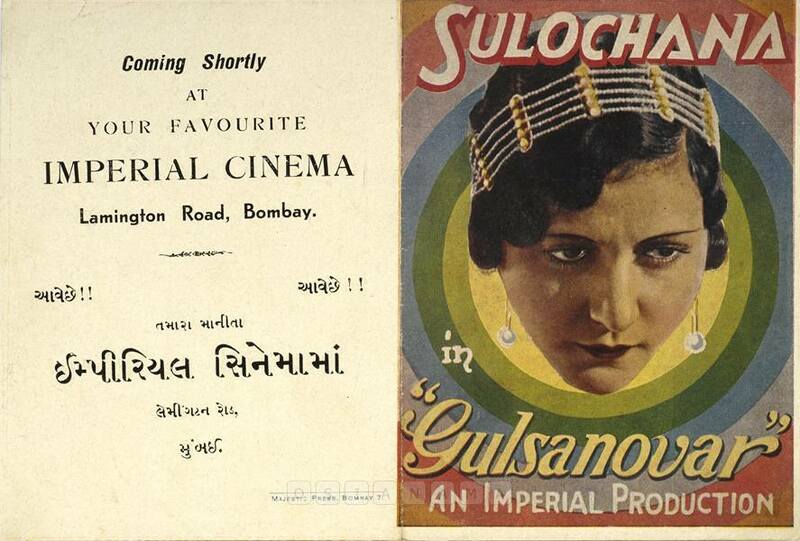 The Jewish contributed to Indian films in different ways: as actors – Sulochana, the first female superstar; Rose, a popular starlet; Pramila, the first Miss India; Nadira, the “quintessential vamp” who starred in several films of Raj Kapoor, writers (Joseph David Penkar, who was also a lyricist and playwright, wrote India’s first talkie, Alam Ara), publicist (Bunny Reuben). Any in other fields? There were Jewish cameramen. There was a renowned director, Ezra Mir. He made Sitara, in the 1930s, a film that had the most number of kisses, which led to it being banned. There were producers as well. Sulochana was a producer. So was Pramila. She had a production company, Silver Films. They had a formative role in shaping the film industry. The censor board constantly tried to stop Pramila from performing. There was a famous debate about Sulochana in the parliament [it was rumoured that she earned more than the governor of Bombay]. They were bold; they were cutting-edge. More importantly, the Jewish were active in Bollywood during the period – the ’30s and the ’40s – when anti-Semitism was at its peak in other parts of the world. For me, as a Jew coming to India, the most surprising discovery was that India had no indigenous anti-Semitism. And it’s got to be a unique country in that sense. And I think there’re several reasons for that. One major reason for anti-Semitism in the West is that it comes from a Christian tradition, and its notions of the Jewish killing Christ, and therefore they’re God-killers. In India, you’ve hundreds of Gods, and here’s a set of people with another one, so what’s the problem? And India is a diverse country at every level – geographic, cultural, linguistic. So here’s another group that’s different; they didn’t stand out. While in Hollywood, for example, Jewish people went into cinema to be American, to conceal their Judaism. In Hollywood, they were changing their names so they wouldn’t be seen as Jewish. In India, none of those motives existed. And in Hollywood, they were recent immigrants, trying to fit in. In Indian cinema, they’ve been in the country for hundreds, if not thousands of years. So it’s a totally different experience, and I think there’s a broader story about this land without anti-Semitism, because perhaps in other countries there would not have been a Sulochana, because no one would have accepted a Jewish star. Or they wouldn’t have accepted a first Miss India of their country as a Jew. So, it’s a really positive story. I first came to India to research this film in 2006, and now it’s 2017, and those messages are more important than ever. During the course of researching and filming Shalom Bollywood, what part of the story – about either the Jewish in Bollywood, or the Hindi film industry of yore, or the interaction between the two – struck you the most? The coincidences: in terms of how people got their breaks. Pramila was just on a set, watching her cousin Rose. She was a teacher in a Jewish school in Calcutta. She didn’t plan to become the first Miss India and a superstar. Besides, what happened to these people in their latter lives was quite sad. When your fame goes, when your beauty goes, people can forget you quickly. They all paid a price for having such careers. But what struck me was that, in many respects, their lives were a case of art imitating life, rather than the other way around. Nadira was famous for drinking and smoking on screen. She drank and smoked a lot in real-life, too. Rose was portrayed as a modern Western Anglo-Indian woman. Well, she was in real life. You’ve been crowdsourcing funds for the film. Why has it been difficult to find a producer? I make commissioned films. The broadcasters come along, they give me several hundred thousand dollars, and I make a film. The problem here was, I’m based in Australia, and the story is set in India. Then I did have broadcasters who were interested. So I’d pitch the film to them, and they’d say, “It’s too historical, make it more contemporary.” So I’d make it more contemporary, and go to another broadcaster, and then they’d say, “It’s too contemporary, make it more historical.” Then I’d see another one, who would say, “It’s too Jewish, make it more Indian.” Then another one would say, “It’s too Indian, make it more Jewish.” And it reached a point where I said, “Okay, I’m just going to tell the story as I see it. And tell the story as I think it is.” And so after a while, it was a conscious decision to go independent.